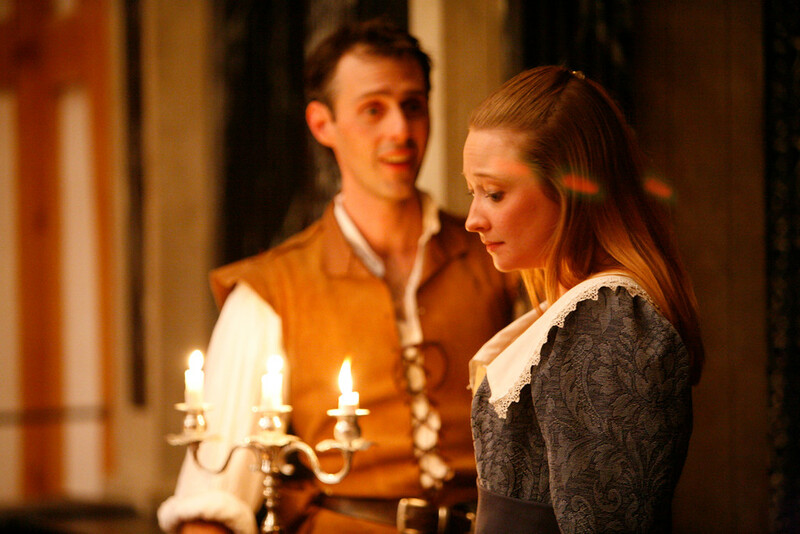 John Harrell and Tracy Hostmyer in THE THREE MUSKETEERS. Photo by TOMMY THOMPSON. 2005. 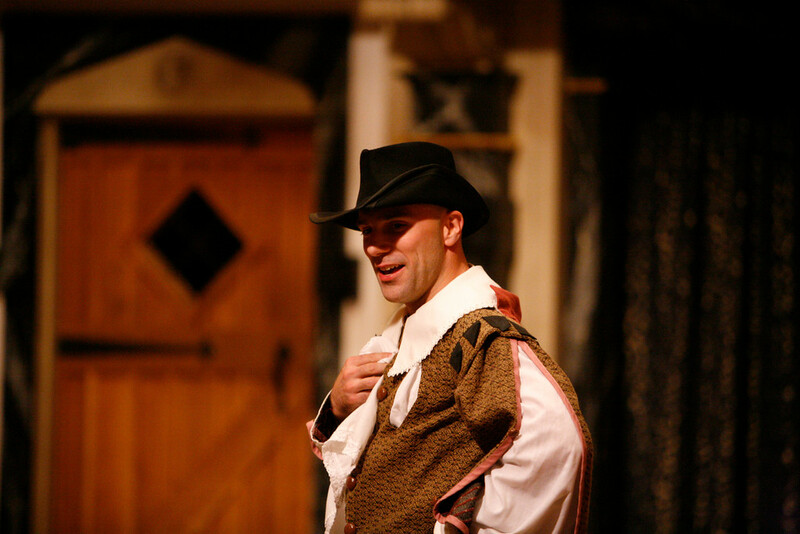 Khris Lewin in THE THREE MUSKETEERS. Photo by TOMMY THOMPSON. 2005. The cast of THE THREE MUSKETEERS. Photo by TOMMY THOMPSON. 2005. Eric Schoen and Sarah Fallon in THE THREE MUSKETEERS. Photo by TOMMY THOMPSON. 2005. Vanessa Morosco and David Loar in THE THREE MUSKETEERS. Photo by TOMMY THOMPSON. 2005. 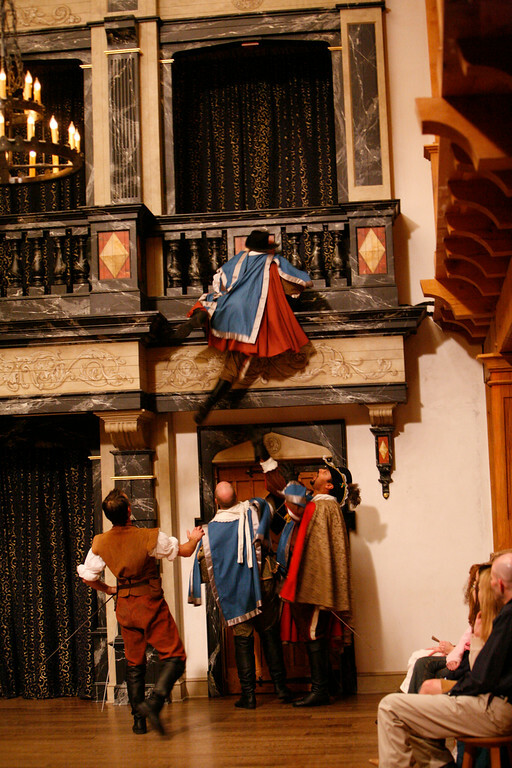 John Harrell and David Loar in THE THREE MUSKETEERS. Photo by TOMMY THOMPSON. 2005. Tracy Hostmyer and David Loar in THE THREE MUSKETEERS. Photo by TOMMY THOMPSON. 2005. Bernard Bygott in THE THREE MUSKETEERS. Photo by TOMMY THOMPSON. 2005. 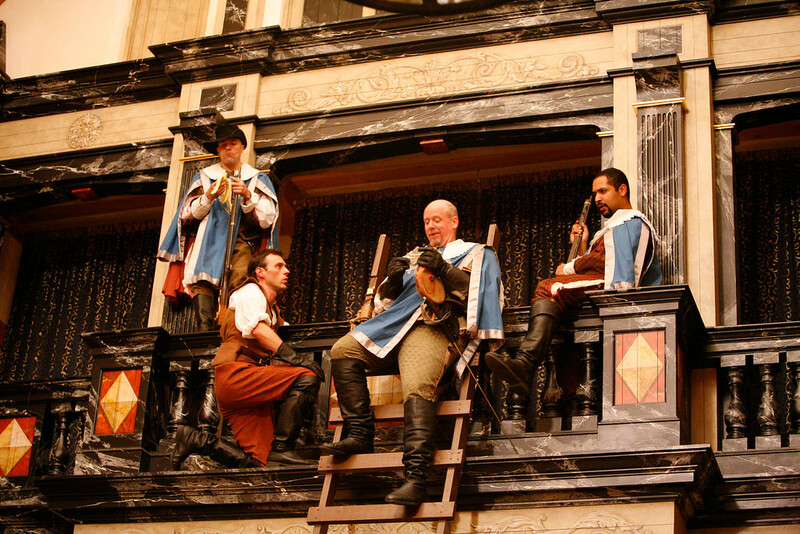 Khris Lewin, Eric Schoen, James Keegan, and René Thornton, Jr. in THE THREE MUSKETEERS. Photo by TOMMY THOMPSON. 2005. D’Artagnan gets a final lesson and leaves his rural home in Gascony for Paris. In Paris, D’Artagnan runs into Rochefort and Milady De Winter, two agents of Cardinal Richelieu. De Treville, Captain of the King’s Musketeers, chastises the Three Inseparables for fighting with some of the Cardinal’s Guards; one of these three musketeers, Athos, was wounded in the latest brawl. De Treville, a war friend of D’Artagnan’s father, offers to help D’Artagnan join the Royal Academy; after serving in a lesser regiment for two years, D’Artagnan hopes to one day be one of the King’s Musketeers. D’Artagnan abruptly leaves De Treville to follow Rochefort; D’Artagnan then meets the Three Inseparables, one by one, each of whom challenges D’Artagnan to a duel behind the Luxembourg. On his way to the Luxembourg, D’Artagnan meets Constance Bonancieux, the Queen’s dressmaker. D’Artagnan begins a left-handed duel with Athos; they are interrupted by the Cardinal’s Guards. Fighting, friendship, diamonds, deceptions, heartbreak, and heroics ensue. Typically, the first days of rehearsals for a new show by Shenandoah Shakespeare’s American Shakespeare Center (ASC) include two important elements: a Renaissance Run and tablework. A Ren Run involves the actors having all of their lines memorized, spending a day and a half to work out entrances/exits/ideas for different scenes, and putting on a play with no help from the director. 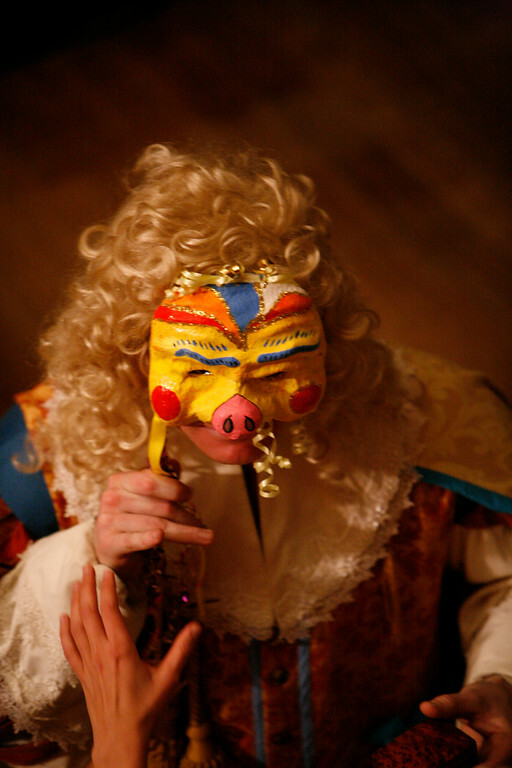 This exercise is designed to give actors a taste of how the Renaissance acting companies might have put on their shows with very few group rehearsals and without directors (we’ve expanded this idea for our Actors’ Renaissance Season in February and March). The Ren Run is also a way for the actors to present ideas about their characters and the play for the director to consider before she or he begins the rehearsal process; we work very collaboratively with our actors and typically a lot of their ideas from this Ren Run often become part of the final production. The other typical hallmark of early ASC rehearsals is tablework; we sit around with lexicons, OEDs, and a bunch of rehearsal books to work through every scene. The actors present line-by-line paraphrases of Shakespeare’s text, we explore scansion in every line (is the scene in verse or prose, do characters go back and forth from prose to verse, is the verse regular or irregular, and why, why, why? ), and we investigate sounds, language, and meanings in the text. We didn’t do either of these things when we started rehearsing The Three Musketeers. Our production of Musketeers is like a musical that uses fights instead of songs as the backbone of the story. Actors in Renaissance companies were probably as skilled in swordplay as modern actors in an improv comedy troupe are deft with heckling. While Shakespeare’s actors may have been able to put together “Duel 2B” for Laertes vs. Hamlet very quickly, there’s simply no way that ASC actors could (or should!) attempt to put up two dozen sword fights with a day and a half of rehearsal. So a Ren Run seemed like a bad idea. And because our scrip fro Musketeers (wonderfully adapted from the Dumas novel by David Richmond from Kentucky) wasn’t Shakespeare, our usual tablework routine simply wasn’t needed. We were dealing with a different animal. Dumas wrote his most famous novel in 1844 but the story is set in 1625, less than a decade after Shakespeare’s death in 1616. Like Shakespeare, Dumas uses actual events and people as jumping off points to tell his tales; neither writer is a slave to historical accuracy and both play freely and loosely with the facts to suit their purposes. For those interested in keeping the fact vs. fiction scorecard in the Dumas novel, www.hoboes.com/FireBlade/Dumas/History/ is a fine resource for a brief overview. David Richmond’s adaptation is, quite frankly, the most faithful to the novel of all the versions of Musketeers I read. This version does depart from the novel in a few places, but not nearly as dramatically as others. Some versions have Dumas himself as a character/narrator, some versions revolve around a theatre company performing the play, and still others revolve around requiring an actual revolve on the stage. Mr. Richmond’s streamlined telling reminded me of the 1972 film starring Michael York and Raquel Welch. But, more than any other important factor for me, Mr. Richmond’s version delivered a powerful, straight-forward story that breathed real life into these characters and could open up the “fourth wall” to allow the audience to participate as a part of the Musketeers’ world. We often go off the Shakespeare path here at the ASC to do great plays written by someone else. In our 2005 Summer/Fall Season, we’ve got Shakespeare’s wackiest comedy, his most profound tragedy, one of his late (problem) comedies, and we’ve got this action-romance from Dumas. It ain’t Shakespeare, but we hope the rollicking fun takes you on a riveting ride.